With 6.1 million total smartphones activated in the quarter, Apple's iPhone accounted for more than 77 percent of AT&T's smartphones. Though Apple remained dominant, AT&T noted that sales for Android and Windows smartphones also reached record levels. 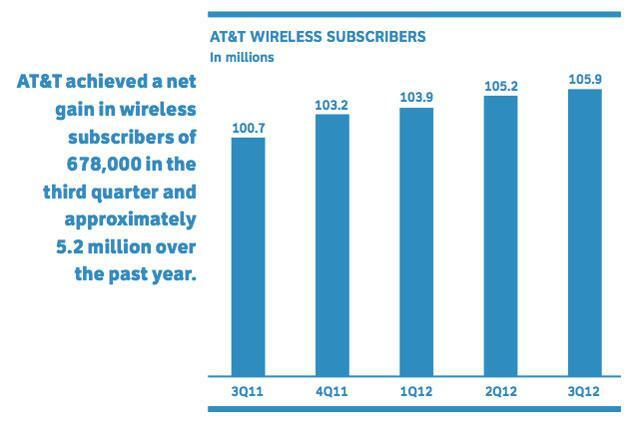 Of the 4.7 million iPhones activated on AT&T, 18 percent of those were new to the carrier. The carrier also noted that its postpaid results were affected by iPhone 5 inventory constraints, though AT&T's press materials did not indicate exactly how many iPhone 5 units were sold at launch. Constraints on iPhone 5 inventory resulted in the "vast majority" of iPhone sales in the quarter going to existing customers. AT&T noted there was "considerable pent-up demand" for the iPhone 5, and that Apple's latest handset set a sales record during the first few days of the preorder period. Last week, AT&T's chief competitor Verizon revealed that it sold 3.1 million iPhones in the third quarter, and that 650,000 of them were iPhone 5 units. Verizon sold a total of 6.8 million smartphones in the quarter, while Android devices accounted for 3.4 million smartphone activations. Apple's share of the smartphone pie at AT&T is considerably higher because AT&T was Apple's exclusive iPhone carrier partner for years before Verizon, and later Sprint, joined the fold. Overall, AT&T saw 63 cents diluted earnings per share, compared to 61 cents in the same period a year ago. It also saw record cash from operations of $11.5 billion, and free cash flow of $6.5 billion. "We had another impressive quarter with strong earnings growth, record cash flows and solid returns to shareholders through dividends and share buybacks," said Randall Stephenson, AT&T chairman and chief executive officer. "In wireless, we had another excellent smartphone quarter, penetration of usage-based mobile data plans continues to climb, and our 4G LTE network build is ahead of schedule. And in wireline, our IP network continues to deliver strong gains in U-verse high speed Internet connections, which helped drive an almost 10 percent increase in broadband data ARPU." AT&T's earnings come a day before Apple is set to report its own quarterly results. Apple's September quarter will include the first week of iPhone 5 sales.